While many people have heard of dental implants, very few people know much about the actual process involved so we produced the following article. First of all, the good stuff ! Dental implants are the best way of replacing lost teeth and are almost universally recommended for patients who fit the profile for having implants placed. 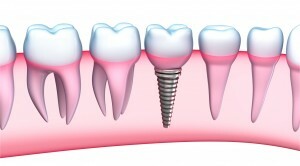 Essentially, the implant is screwed or gently tapped into the jawbone and replaces the original tooth root. Modern implants actually merge into the real jawbone and become a part of it, meaning the dental implant is rock solid and should give many years of excellent service. Properly placed implants will help to save adjacent teeth, because additional stress is placed on these teeth when you have gaps due to lost teeth, so you protect your natural teeth from even more losses. 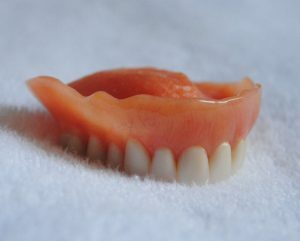 Patients report much easier chewing and more confidence in smiling and eating after having the procedure, and there’s no doubt that patients experience is much improved – you must have heard peoples’ dentures clicking or slipping when they speak ? Well, there’s zero embarrassment when you have dental implants placed. Also, they look really good ! Now on to the actual process itself …. Implant placement can take anywhere from 6 weeks to 6 months depending on the individual patient and the number of implants required. You will have an initial visit where the dentist will do an assessment as to your suitability for the treatment. This visit will involve a dental xray and also a CT scan if required. At this visit, an impression of your jaw may also be taken. Assuming you are suitable for the dental implant procedure, then the next stage will be to discuss the anaesthesia, which will take the form of local, sedation or general anaesthetic. With the information from the first visit available, the dentist will now know if any bone grafts are required. If so, a general anaesthetic will be necessary. If it is a “straightforward” procedure not involving bone grafts, then the dentist will administer a local anaesthetic – you should not eat or drink for around 4 hours before this and it is probably advisable to have someone on hand if you need a lift to get home afterwards. The most used procedure involves two steps : In the first stage, a small screw or tap will be placed into your jawbone. This is effectively a new tooth root, and will become the base for the crown to be attached in the second part of the process. The dentist drills a small hole into the jaw and places the implant into the hole. The incision is then closed and the jaw is given time to heal, perhaps up to 3 months. This allows the dental implant to fuse to the bone. The next stage is the restoration – the dentist will reopen the incision, and fit a small collar on to the implant called an abutment. The crown or replacement tooth is then attached to the abutment. Depending on the scale of the work involved, a single tooth or a bridge or denture can be attached. Finally, there will be regular check ups in the post- implant period to monitor your progress.